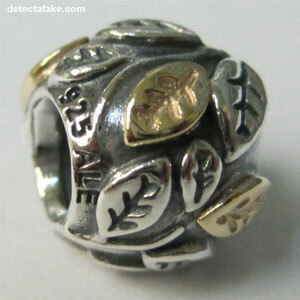 Pandora was founded in 1982 by Danish gold smith Per Enevoldsen and his then wife Winnie Enevoldsen. After a successful wholesale venture, in 1989 Enevoldsen hired in-house designers and established a manufacturing site in Thailand, where it is still located today. 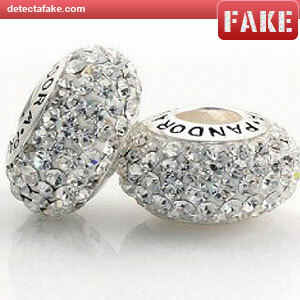 Since then a growing number of fake Pandora jewelry has been flooding the market. 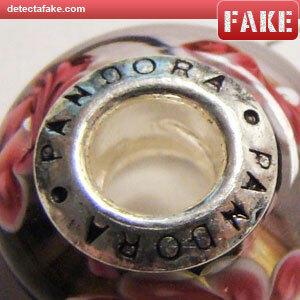 Below are a few steps to identify fake Pandora beads & charms. First, look at the overall quality. 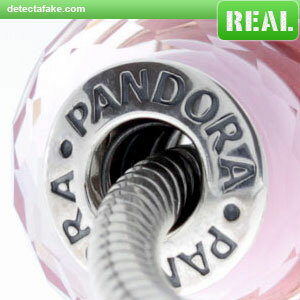 Make sure "PANDORA" is spelled correctly and all stamps are clear & deep. 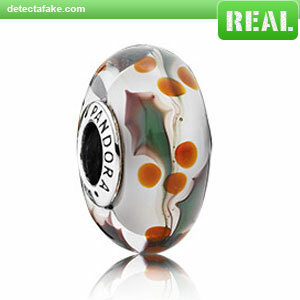 Next, if you're looking at a glass bead, they should have "PANDORA" on 2 sides separated by dots. That is true for most, but there are some new ones with "PANDORA" and "S 925 ALE" separated by dots, like the one above/right. 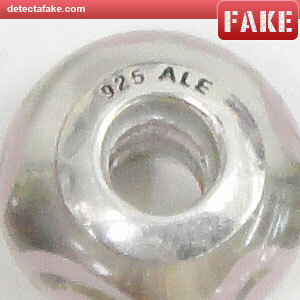 Next, the bead or charm should have "925" and "ALE". The "925" is the amount of silver purity (92.5%), and the "ALE" is the initials of the founders father, Algot Enevoldsen. 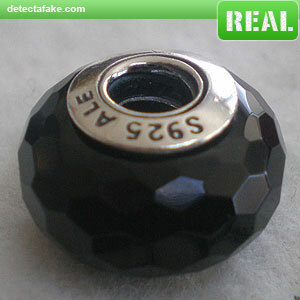 If the bead is gold, it will have "585" for 14k or "750" for 18k. 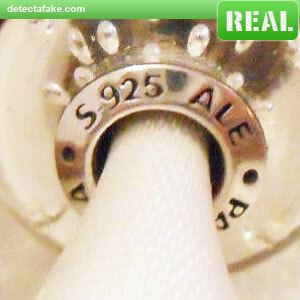 Charms & beads that were made in 2011 and earlier will not have the "S" before the "925" like the one above. The ones made after 2011 will either have an "S" for silver or a "G" for gold. Next, look for a threaded core. The threads are used to keep the beads and charms from sliding off. 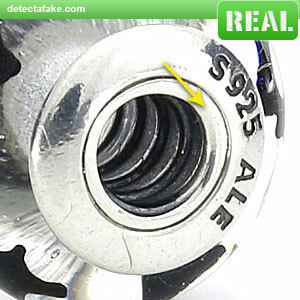 Many of the fakes leave that detail out. 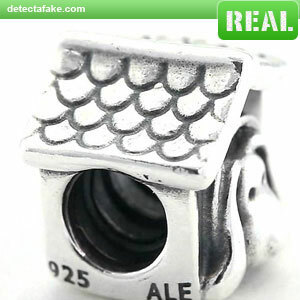 With the exception of some of the Openwork charms, all authentic beads & charms should have a threaded core. 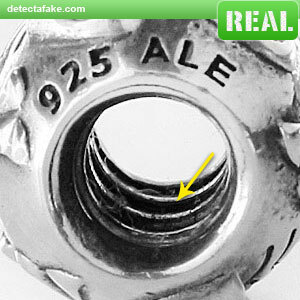 Next, if it does have a threaded core, make sure there are threads throughout the core, like the real one above. Notice the fake one above only has one thread. Also the threads should not be too shiny. 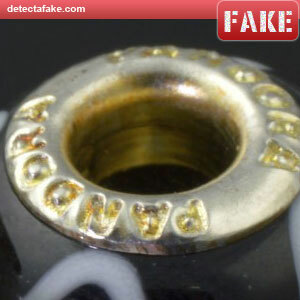 The fake one above has a very cheap look to it, even in the core. Next, look at the "925" & "ALE" stamp. The stamp should be deep and very clear like the real one above. 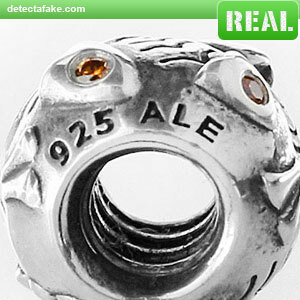 The problem with the fake one above is that the "ALE" is bold and the "925" is not. There should be no difference in font between the two. 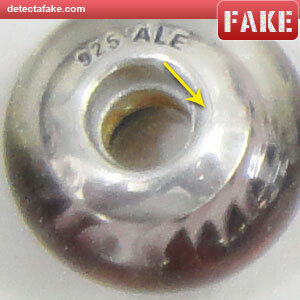 Next, if your looking at a glass bead, on the "925 ALE" side, you should see a ring where the collar is joined to the core. 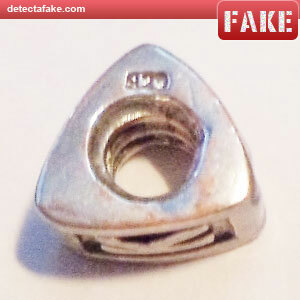 Many of the fakes are soldered into one solid piece, like the fake above. Next, look at the "PANDORA" font. It should be consistent, bold and high quality. Notice the fake above looks very inconsistent. The "N"s and "A"s look much more bold (and sloppy) than the letters next to them. Also, notice how much extra space the fake one has between the dots and the "PANDORA"s.
Next, look at the quality and detail. 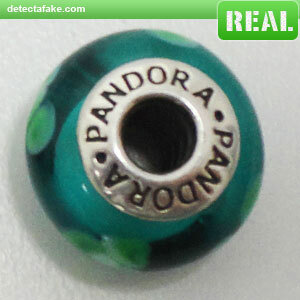 Authentic Pandora charms and beads have very precise details. 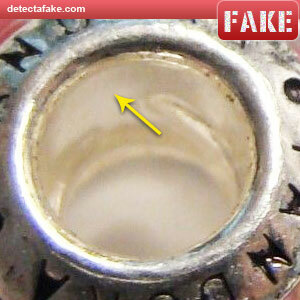 Counterfeit Pandora charms often have sloppy details and counterfeit beads often have blurred details. And last, Pandora has never used Swarovski crystals. 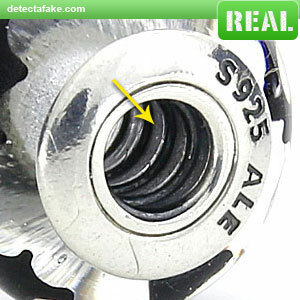 If you see one like this, it's fake.